One thing you can't plan for on a gap year is emergencies, including cancelled travel plans. Weather, holidays, political unrest, even just overbooking could all contribute to some part of your journey being cancelled. Arrange for appropriate travel insurance before your gap year so that you'll be better covered in the event of cancelled travel plans, try to keep a mobile phone with you should you need to ring around to make new plans, speak with a company representative if at all possible and keep your receipts from any alternate arrangements should you need to submit them later. Many large insurance houses in the UK offer travel insurance. Travel insurance usually covers things like reimbursement if you need to cancel travel (such as because of illness), medical expenses cover, hospital benefit, personal accident cover, cover for lost, stolen or damaged luggage, cover for cash and personal documents and even cover for legal expenses. Not every policy covers the same items, covers extended travel, or offers 100% cover in all areas, so it is important to understand every aspect of a travel insurance policy before purchasing it. Some insurers also offer specific backpacking or gap year travel insurance. These policies typically cover the extended period of gap year travel (usually up to 365 days) as well as common gap year activities like winter sports, but coverage for travel to certain areas such as the USA may not be offered on basic policies, so it is important to read each option carefully once you have your gap year planned. If you are faced with cancelled plans while travelling your mobile phone will likely become your new best friend. Not only will you be able to call helplines, but you will also be able to call family or friends who might have more information for you (from television news, or Internet access). If you have Internet access on your own phone you might even be able to re-book cancelled plans or make alternate travel arrangements without having to wait in queues or be put on hold by automated voices. Don't forget to keep the nearest British embassy, consulate or high commission phone number with you as well. In the event of major disasters and emergencies they may be able to help. Speaking with a customer representative will no doubt be an exercise in patience should your travel plans be cancelled. In fact, you may end up waiting for hours in queues to get to an actual person, or for hours on hold before reaching a human voice. Try not to take your frustration out on these people. Not only were your cancelled travel plans likely not their fault, but by remaining polite you might just win them over to provide a little bit better service for you. Always take down the person's name, position in the company and the date and time should you need to quote their answers later. Explain briefly what you need ("My flight was cancelled but I still hope to get to Bangkok tomorrow by midday. What are you options?") and have all necessary documents on hand should you be able to re-book immediately. 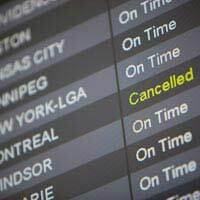 Making alternate arrangements for cancelled travel plans can be costly, not to mention frustrating if the cancellation was not your fault. Keep receipts from items like food, beverages, accommodation and alternate transport which were incurred as a direct result of the cancellation, as well as receipts from previous bookings that needed to be cancelled when you could not get to them (for example, a hostel in another city after a flight was cancelled). Insurance policies will require such documentation should you attempt to claim back costs, as will companies willing to honour such claims in the event that they are liable for the cancellation. Coping with cancelled travel plans on a gap year requires patience and flexibility. Arranging appropriate travel insurance, keeping a mobile phone on hand, speaking with a customer representative and keeping receipts from alternate arrangements should all help you more efficiently book alternate travel plans and claim back money lost from the cancellations.